Ever wonder what the heck your yoga instructor really means when he or she says to, "set an intention for your yoga practice?" We all know that an intention is just a plan, but what does that mean for a yoga class? Does it mean to remind yourself that you intend to get through the class without any major guffaws? (Most of us do.) Obviously, your intention in a yoga class is to move through yoga asanas and practice...well, yoga. But if that's as far as your intention usually goes, you might want to consider pushing the boundaries. What is an intention for yoga? Ultimately, an intention really is just a goal for your life or your yoga. It doesn't have to be any more complicated than that. It is something to aspire to, to focus on or to provide inspiration. But a simple one-word intention can mean very different things for different people. For instance: a "balance" intention for one person might mean challenging the body through physical balance postures, but another yogi might meditate on striking a balance between work and play...etc. Your intention could be physical, emotional or spiritual, but it's always personal. How to keep an intention? When I first started setting concrete objectives for my practice, I would often leave it behind as I moved along in my practice. Unless my instructor consistently reminded us to focus on our intention, I was just focusing in general. There is obviously nothing wrong with "forgetting" about your intention, surrendering yourself in your practice or focusing on your breath, but gentle cues from your instructor can help. If you're practicing on your own or want more reminders, try to create a habit of finding intention each time you enter a particular pose. For instance, you could make a point to remember your intention every time you enter Downward Facing Dog. In my experience, I usually choose 1 word or short phrases, just for simplicity. Sometimes, it helps to think about it before you even come to your mat. What is stressing you out lately? What do you need more of in your life or in your practice? Focus on whatever that may be. 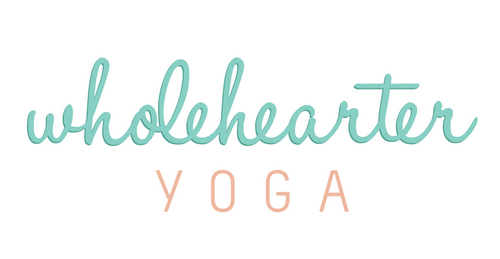 Intention signage I created for my yoga studio. When to set an intention? The beginning of practice is a logical time to set an intention, remembering it throughout class. But if you notice yourself feeling distracted, the middle of your practice is a great time is well. Or, at the end, set an intention for your Savasana or meditation time. Having a solid intention is a great way to stay grounded, focusing on what's most important for you. Whether it's throughout your day or your yoga practice, choose something to focus on that is meaningful to you. You'll soon discover how powerful that can be! Namaste!